This sugary, highly aromatic syrup is best served over thick yogurt and used to sweeten tea or drizzled over slices of country-style bread. Bergamot syrup sweets are an all time classic of Greek winters, lovingly pushed into the hands of visiting city relatives by aunts and grandmas back in the countryside. This sugary, highly aromatic syrup takes a little effort but is well worth it. 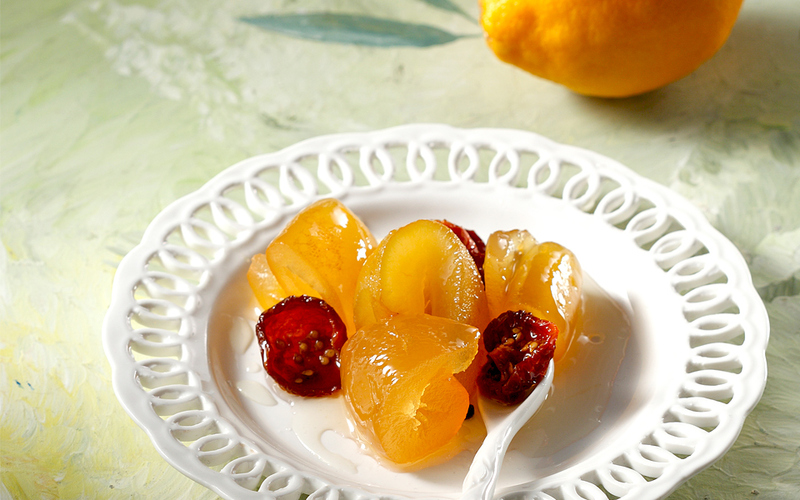 It is best served over thick yogurt and used to sweeten tea or drizzled over slices of country-style bread. Grate the bergamots on the fine side of the grater to remove the rind of the fruit, which is quite bitter, being careful to stop when you reach the white interior. The highly aromatic zest can be kept in a jar in the refrigerator to flavor creams, cakes etc. Slice off the top and the bottom of each end of the bergamots. Score the outside from the top to the bottom and peel off around 6-8 slices of the white rind with your fingers. Roll up each slice and fasten with a toothpick. Discard the fruit inside. Boil three pots of water. Add the rolled peels to the first pot and boil for 20 minutes. Drain the rolls, rinse, and add them to the second pot to boil for another 20 minutes. Drain, rinse and add them to the third pot, immediately removing it from the heat and leaving the rolls in the pan overnight. The next day, add the sun-dried tomatoes to a bowl with hot water and leave for about 20 minutes or until tender. Drain and set aside. Drain the bergamot rolls, rinse and remove the toothpick. In a large saucepan, add the honey, sugar, 600ml of water and peppercorns. With the tip of a sharp knife, slice open the vanilla pod lengthwise. Scrape the vanilla seeds out of the pod and add them along with the empty pod to the saucepan. Bring to the boil. Add the sun-dried tomatoes and bergamot rolls to the syrup and cook over high heat for about 20-25 minutes or until the syrup thickens. Spoon off any foam that appears during this time. Add the lemon juice and continue cooking for another 15 minutes. Turn off the heat but leave the pan on the stove for two hours so the bergamot absorbs the syrup. Remove the vanilla pod and boil once more for 20 minutes. Remove the last traces of foam and pour into sterilized jars. Store in the refrigerator once opened.